Ava DuVernay’s Selma is an outstanding piece of filmmaking – measured yet passionate, artistically honest and illuminating. There has been heated discussion about the film’s supposed unfairness to President Johnson. My companion (who was a teenager in 1965) commented as we left the theater, “If anything, I think they were generous in how they depicted LBJ.” Paul Webb’s script compresses the historical record, as dramatic representations must, but it is not, as Joseph Califano (a special assistant to President Johnson) has claimed, “[filled with] falsehoods, immune from any responsibility to the dead.” Amy Davidson writes in The New Yorker, “It is ahistorical to insist that a film show how civil-rights leaders ought to have experienced Johnson, given his fine intentions, and not how they did.” To me, this is the heart of the matter. Reading the controversy, I wondered if the filmmakers might be tweaking history to further elevate Martin Luther King Jr. for posterity. Now I’ve seen the film, and I found it essentially true to the accounts I’ve read over the years. (It should be noted that Califano’s version of the particulars differs from Taylor Branch’s At Canaan’s Edge: America in the King Years, 1965-1968. Califano was appointed in July, 1965, and most of the events depicted in the movie happened before that – Bloody Sunday was March 7, 1965.) 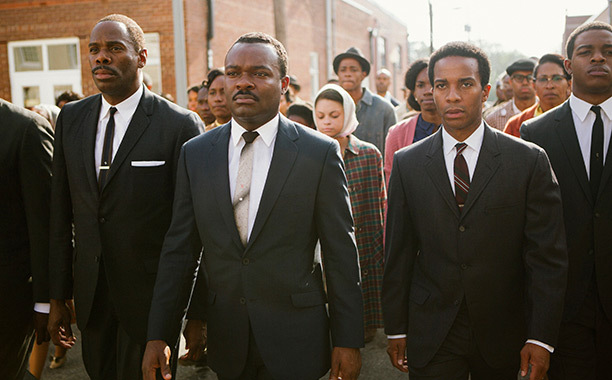 DuVernay and Webb give Johnson his due: he brought the Voting Rights Act to Congress, and Selma portrays this. It’s the finale, for heaven’s sake. DuVernay’s direction reflects what I think is a feminine sensibility. By this I mean that plot is less important than character, and scenes are held longer than we expect, the better to observe reactions. Relationships are important. Many directors would keep the beats of the plot thumping, and use violence to intensify reactions. Instead, Selma’s violence is largely felt, conveyed through the reactions of those who witness it. (It feels just as shattering, but not as manipulative as, say, Alan Parker’s Mississippi Burning.) The film’s centerpiece is two attempted marches across the Edmund Pettus Bridge, with triumph ultimately earned in retreat. This is difficult to dramatize, but DuVernay and Oyelowo make absolutely clear what happened, without resorting to third party explanation. More importantly, they show King’s doubts from moment to moment, and the second guessing of those around him. I particularly liked how DuVernay depicted government antagonism, using FBI surveillance reports as title cards, with no sinister agents to be seen. The effect is a sense of oppression, and acknowledgment that this kind of surveillance actually happened, without taking focus away from King and his cohorts. I saw Selma in the cinema on Martin Luther King Jr. day, with perhaps ten other people in the theater. A few rooms over, American Sniper played to a sold-out crowd. The action in Selma culminates with the Voting Rights Act of 1965, which would be essentially dismantled by The Supreme Court in 2013. At the 2014 Golden Globe Awards ceremony, Tina Fey joked “…the movie Selma is about the American civil rights movement, that totally worked and now everything’s fine.” (Oprah Winfrey, who appears in Selma and is one of its producers, looked puzzled.) In 2012, 59% of eligible voters cast a ballot; in 1968, it was 62% (the numbers drop to the low 40’s in non-Presidential election years.) Over time, the percentages have been pretty consistent. It’s difficult to imagine people walking across a bridge, knowing they might be attacked and hurt, to protest obstacles that prevent them from doing something that half of U.S. citizens don’t seem to want to do in the first place. It’s also difficult to understand why the attackers did what they did. Histories like Selma are ambiguous at best, and perhaps don’t offer the satisfactions of killing one’s enemies. But we need artists like DuVernay, Webb and Oyelowo to keep wrestling with these issues. The lasting point Selma makes is that progress comes slowly, victories are small and indecisive, frustrations abound. And yet, the effort is essential. The Academy of Motion Picture Arts and Sciences announced its Oscar nominations on January 15, 2015. Selma was nominated for Best Picture and Best Original Song; its director and star (and costars) were overlooked. Normally, I throw up my hands and watch the Oscars anyway, reasoning that awards shows and top ten lists are just conversation pieces. Academy Awards open doors. Those who win, even those who are nominated, are given opportunities they didn’t previously have. Those opportunities extend to others, as well. When the money people consider whether to finance a project, they might say, “The problem is, you’re a woman. Films made by women don’t win awards, and they don’t sell. Sorry.” A predominantly white-male club is not going to become less so until it makes a decision to be diverse. Some will argue, “They’re only choosing the best.” But how does one get to be the best? By having opportunities to practice a craft. The Academy has a bad track record with regards to diversity. If it truly wants to promote “the best” in motion pictures, something needs to change. (The alternative is to admit that it’s all a crock, and they’re just in it for the ratings and the parties. But that can’t be true, can it?) Here’s an idea – count votes in inverse proportion to the industry makeup. If only 7% of movies are directed by women, a vote for a female director would carry a 93% weight; a vote for a man would carry a 7% weight. Unfair? Eventually, it would become fair. It sure isn’t now.